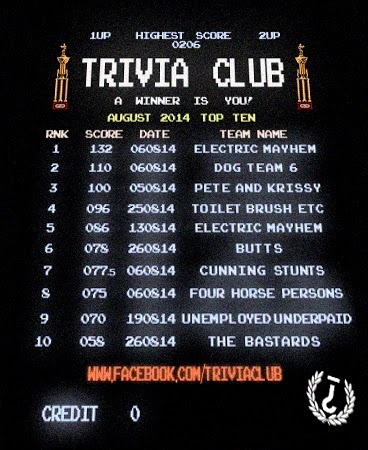 Electric Mayhem had a strong August, Trivia Club's 29th month, and it shows on the scoreboard as they're the only team to show up twice on the board. Team Name, the team that split up a potential Summer of Mayhem for the Electric team, missed out on the top ten but they did attain a record-tieing margin of victory of half a point over Mayhem's own half point on the 20th of August. Though the 58 points was The Bastards highest, they also came in 11th and 12th on the month with 50 and 47 points. Funnily enough it was the middle score, the 50 points, that won them a Golden VHS on August 12th the Matthew Smith-hosted edition of Trivia Club at Lou DAWG's. The Electric Mayhem garnered the highest score of the month and the highest score of the month at Cardinal Rule, after not being in the Top Ten of July 2014. Newcomers, Butts, got the highest score at Lou Dawg's this month, but the highest scoring new team were Dog Team 6! Pete & Krissy were the only other team to crack 100, taking the top spot at Handlebar in the process. Toilet Brush Transients were Hitch's highest scoring team of the month! The 75th edition of Trivia Club at Cardinal Rule is the most represented night on the Top Ten, with four entries. The lowest scoring Golden VHS winners in the Top Ten were the Unemployed and Underpaid.